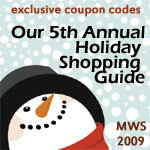 I’m so excited to announce the launch of our 5th annual Holiday Shopping Guide here on Mommies with Style. Year after year we’ve brought you our Guide where our fabulous advertisers list their coupon codes and hot products for sale this holiday season. The Guide will be up all season so take a gander over and return as often as you need to as you do all of your holiday shopping! This happy little snowman is the face of our 2009 Guide and he’ll be gracing us with his presense on our right hand nav bar all season long. You don’t need to do a thing other than sit back, click and do a little shopping. Take it from someone who has a huge crowd phobia – it’s so much better when you do it from your warm house in your PJs.